Is there a difference between Irish linen and linen fabrics which has been produced elsewhere in Europe? 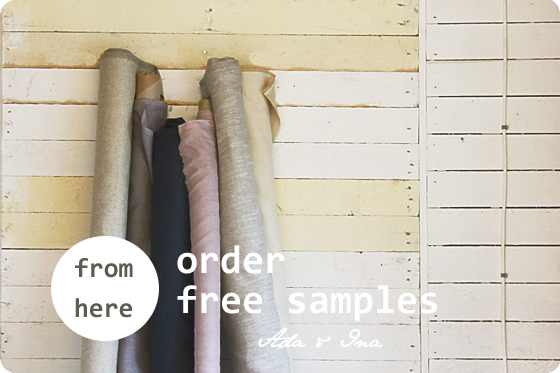 Ada & Ina - natural linen fabrics was founded by a few Finnish linen lovers. We started to import linen fabrics to UK in 2000, since there were so few companies importing quality linen from Central European Mills to UK. However, which we did not quite understand how strong concept Irish Linen is here in UK. Quite often we are asked samples of Irish linen. We do sometimes buy Irish Linen Fabrics to our collection - however most of our fabrics come from other parts of Europe. This does not mean the linen we sell is in any way inferior quality compared to Irish Linen. European linen is just as good as Irish linen and it is manufactured from the very same flax plant. There are differences between the finishes and weaving method, which method is the best for flax processing, weaving and finishing - this is also a matter of taste. Do you like your coffee in black or with milk? The only difference between European and Irish linen might be that one comes from Ireland and another one from Belgium. So the curtain fabric is travelling to your living room about the same distance. The founders of our company have been in textile business over 15 years and have travelled everywhere in the world to find you the best quality linen for curtains and upholstery. In Scandinavia there are many producers which manufacture very high quality linen and even after all these years in business we could not tell the difference between Irish, Belgian and Scandinavian Linen. We buy for Ada & Ina - fabric collection linen and curtain fabrics from everywhere in Europe and only select the best qualities. Occasionally we also buy some Irish linen. Surely there are differences, as said earlier, between the factories and textures between linen produced in different countries and some might use shorter fibres than the others. However we believe that the qualities found from elsewhere in Europe are as good as Irish Linen. We would also like to offer our customers more variety in textures and finishes - that is the reason we do not only buy linen from one source. Occasionally it might be difficult to even tell what is the origin of linen, since for example the Irish Linen might have been only finished in Ireland - so is it then Irish linen? It will be labelled as Irish linen nevertheless. We are not saying this is always the case - however quite often with many products including the fabrics the final finishing is enough to label the products as for example as Irish Linen. Most of our manufactures buy only local flax and so there is now extra air miles or road miles needed. Decide for yourself - order samples of our Linen and we're sure you will find out the differences if there are any. We provide linen for your curtains, blinds and uhpholstery from the best European mills!